We are excited to let you know that our Goal Setting for Success free ebook has been completely updated. Successful people understand the power of goal setting; writing what you want to achieve down on paper so that you can see it and be reminded of it daily. This newly revised and expanded ebook provides a complete goal planning system that works. Additionally, for anyone interested in learning more about SBI, which is the site building tool we've used for over 15 years to create and manage our website, check out our full review of Solo Build-It! (SBI! ), formerly known as Site Build-It! The current password is... SUCCESS (all uppercase) Due to security concerns, we may change the password on occasion. We announce password changes in this newsletter. One of the most popular tools we offer in the leadership library is our free ebook, Goal Setting for Success. This past year we've been sharing some terrific content on the subject of goal setting. 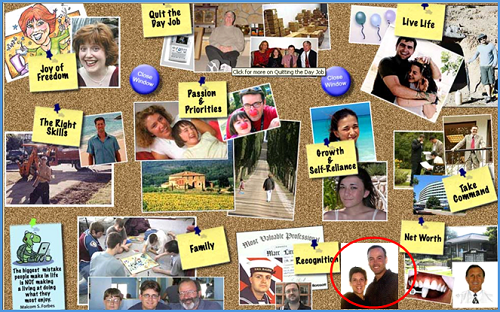 For example, in January we posted an article on the power of creating your Vision Board. In December, 2016 we announced that work had started on a full revision of Goal Setting for Success. We are pleased to announce that the new and improved version of Goal Setting for Success is now available to our subscribers. You can access the ebook now in our Leadership Library. 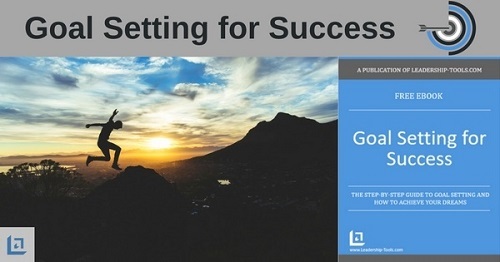 This ebook provides a deep-dive into the subject of goal setting. As you work through the ebook, you'll use other free tools such as our Life Balance - Success Wheel and Master Action Plan (M.A.P.). As you read through Goal Setting for Success you'll discover 33 Success Lessons. These lessons provide timeless wisdom that will keep you motivated to identify your goals, create detailed goal plans, and consistently work to achieve your goals. We invite you to take a moment to check out this new and improved goal setting tool. Leadership-Tools.com was created in 2002 using Site Build-It!, also known as SBI! Sitesell recently changed the name to Solo Build-It! For over 15 years, I've recommended SBI! to anyone who has asked about creating a successful online business. Unfortunately, SBI! has recently come under attack by a company that misleads people with a flood of "Fake Reviews". Imagine if you had a passion that you wanted to share with the world and you were researching website building tools. You've heard of SBI! and you want to read SBI! reviews to verify SBI! customer's real experiences. Doing a simple Google search, typing in keywords such as "sbi review", "site build it", or solo build it", brings up hundreds of reviews - you think. Upon close review, you'll notice a disturbing pattern with many of the reviews that are listed. These so-called reviews provide a comparison of SBI! to another company called Wealthy Affiliate. In these fake reviews, the writer pretends to provide a non-biased comparison between the two products, only to recommend Wealthy Affiliate as the better product. Once this deceptive practice was discovered, Sitesell CEO, Ken Evoy initiated a scientific level study, comparing the two products. The results of this exhaustive study not only proves the Wealthy Affiliate claims are false, it provides solid proof that SBI! results are 33 times better! While Wealthy Affiliate depends on hundreds of fake reviews to market their business, SBI! 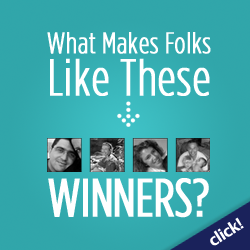 shares hundreds of real examples of high-traffic websites that get results. Armed with the TRUTH, Ken recently reached out to SBI! users, asking us if we would assist him in fighting the fake reviews by writing a real SBI! review, sharing our personal experience using SBI! Being a SBI! customer for the past 15+ years, knowing how much I've learned, and how greatly SBI! has benefited my family, I am happy to assist Ken and the Sitesell team. Here you’ll learn more about my online journey and how I’ve used Solo Build-It! every step of the way. If you're interested in learning more, check out my SBI! review. "E-cards - excellent idea and it works. I have formed a Whatsapp group with my team leaders and every now and again I send them encouraging words, a prayer, a word for the day, thank you, Kudos on a job well done when a project is completed - something to encourage them and to get them through the day. They appreciate it. Thanks for your leadership guidance!" "Excellent. Thank you for all the materials that you publish and share with us. They are very helpful for our lectures, discussions and teaching. More importantly, they are updated and concise in presentation." "Leadership is mission critical for any organization and this site gives invaluable tips - excellent reading material." Let us know what you think, and better yet, tell us what you need.